You are here: Home / News / Books / Holy Cow! More Crusade! It WAS three books…BEFORE the storage facility. It could have been six volumes if we’d taken a kitchen-sink approach, but–with the help of the BABYLON 5/CRUSADE fan panel–we whittled it down to the best of the best. 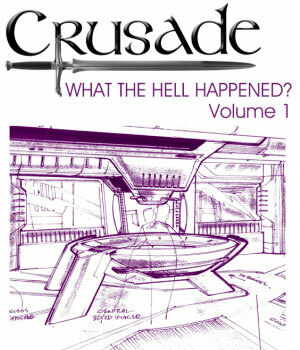 Holy Frack… we’re getting four books on Crusade. Hehe, I allready KNOW ur smile. And that’s not all. There still is an “Other Voices” book to come in the future. I don’t know if it’ll be called ‘Other Voices’. But that’s what we called them for the B5 series and I kind of like it. Trust me when I say that it’s much nicer to have someone else wade through the boxes (and the accompanying dust, spiders and paper cuts) for you and then to sit back to enjoy the end results. I know what you mean, Summer. I’d’ve given anything to have been there. But Jason was probably the best one for the task since he probably didn’t drool all over the Cool Stuff like we would have. You have NO idea… Since I was ten-years-old, all I’ve ever wanted to be was a showrunner and editing these books briefly made me doubt the sanity of my desire. Since I was ten-years-old, all I’ve ever wanted to be was a showrunner and editing these books briefly made me doubt the sanity of my desire. I doubt anyone of us would have actually done enough work to make the book happen as we would be to busy reading to even notice any spiders. Hoping my book comes soon, I’m feeling like the odd man out in this conversation. I do wonder who made the call to expand the series to 4 books? Did Jason make the call?